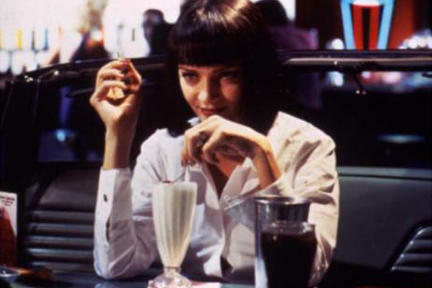 A scene from the film "Pulp Fiction." Director Griffin Dunne and Uma Thurman on the set of "The Accidental Husband." Actress Uma Thurman at the London premiere of "The Accidental Husband." Uma Thurman in "Bel Ami." Uma Thurman as Dr. Emma Lloyd in "The Accidental Husband." Uma Thurman and Kevin Spacey at the Nobel Peace Prize Concert in Oslo. Uma Thurman at the 17th Annual Gotham Awards. Uma Thurman and Annie Lennox at the Nobel Peace Prize Concert in Oslo. Uma Thurman and Al Gore at the Nobel Peace Prize Concert in Oslo. Uma Thurman at the Nobel Peace Prize Concert in Oslo. Uma Thurman at the celebration of the 45th anniversary of luxury brand Valentino's post haute couture show gala dinner and ball in the Parco dei Daini. Uma Thurman at the press conference of Nobel Peace Prize Concert in Oslo. Uma Thurman and Alicia Keys at the press conference of Nobel Peace Prize Concert in Oslo. Uma Thurman and Kevin Spacey at the press conference of Nobel Peace Prize Concert in Oslo. Uma Thurman at the New York premiere of "Burnt."